Thank you for making us your favorite restaurant again for the second year in a row, you’ve honored us with the Gold Putra Brand Award. It is a celebration of the country’s top brands as determined by you, the Malaysian consumer. To show you how proud we are, allow us to award you with 2 Big Breakfast, FREE! Oh yes, McDonald’s is giving away 2 FREE Big Breakfast with minimum purchase of RM5 during breakfast hours (4am – 11am)! 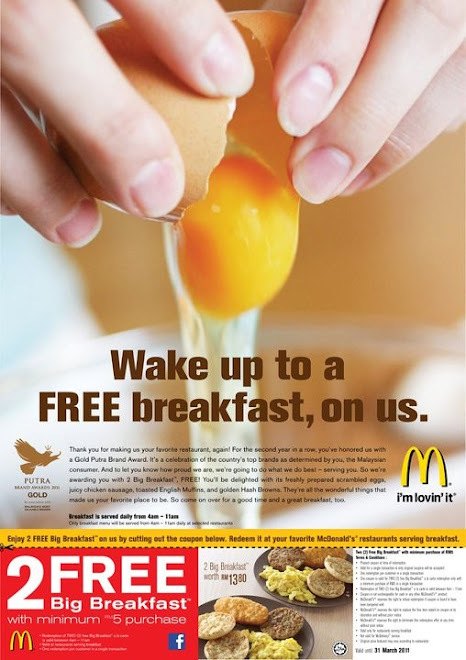 Simply print out the voucher and redeem it at any McDonald’s that serves breakfast meals and it's valid until 31 March 2011. Wakey wakey Ralph; give your taste buds a wakeup call with scrambled eggs, juicy chicken sausage, toasted English Muffins, and golden Hash Browns! Lol wacky wacky R indeed! Eh not bad two FREE BB! I love BB too yum scrambled eggs! Wakey wakey dat is ha ha! Enjoy ur breakfast Mon! Now that is available, we've got to wake up early for this ..goshh! now am awake and hungers.. aiyoh! WOW! It's a great deal, Sweetie! Alamak tinggal dua hari sahaja lagi. Kena cuba ni.. bayar rm5 dapat ekstra dua sarapan pagi besar. Yeee haaa big breakfast big breakfast here i come. You know how i like to have my breakfast big.. whoaho! !